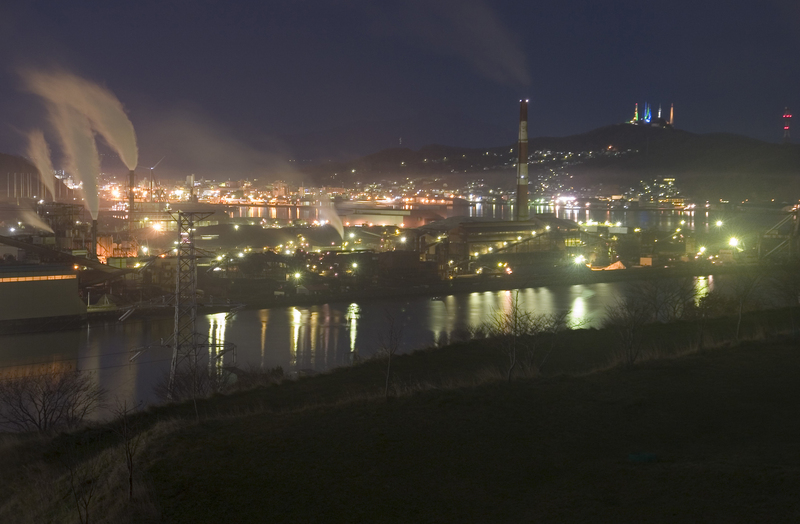 Muroran (室蘭) that about 90,000 people live along Pacific Ocean is the 11th largest industrial city in Hokkaido, and is located in the central part of the Hokkaido. 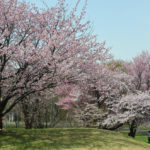 The city has a relatively calm climate, and it is cold with temperatures 20 degrees in a summer, and it is warm with temperatures -2 degrees in a winter. 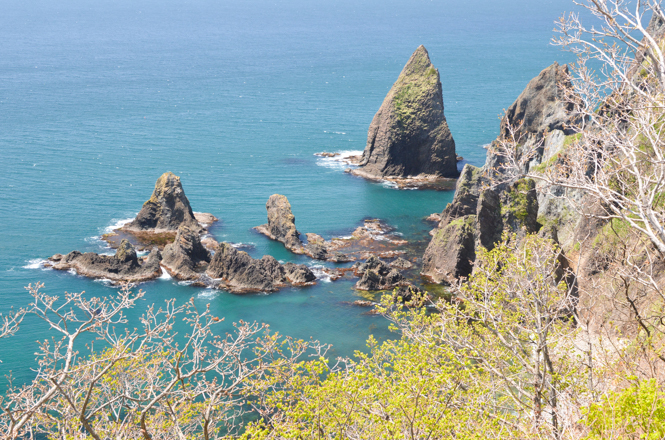 The Muroran mean "A place with a small downward slope" in Ainu language. 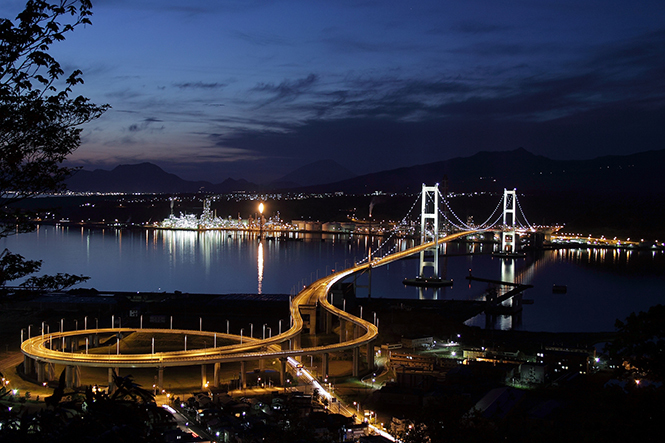 Muroran Port (Another name: Hkucho Gulf) surrounded by Etomo Peninsula (絵鞆半島) is famous for forming a good natural harbor, and has been called "Iron Town" since a long time, and developed as a port town of heavy and chemical industries. 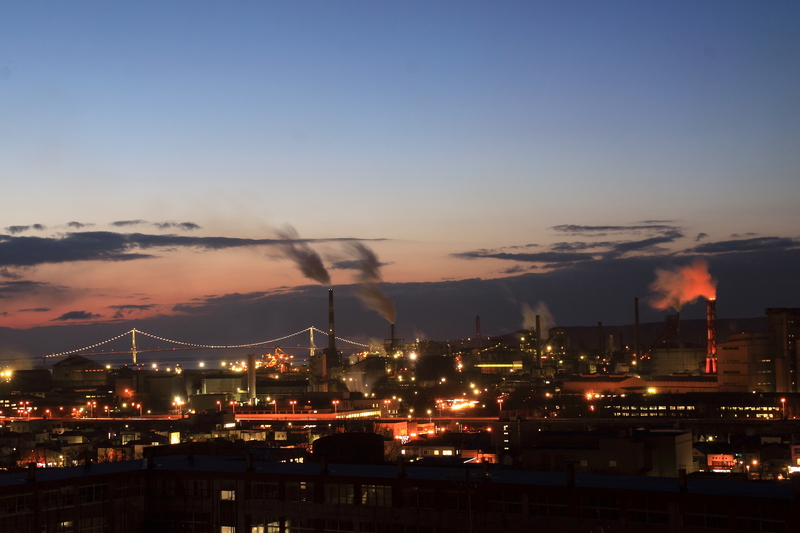 There are factories of Nippon Steel Sumikin (新日鉄住金) and Japan Steel Works (日本製鋼所). 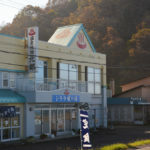 As for Kanamoto (カナモト * the TSE First Section presentation) and Narasaki Industry (ナラサキ産業 * the TSE Second Section presentation), here is a establishment of their business place. 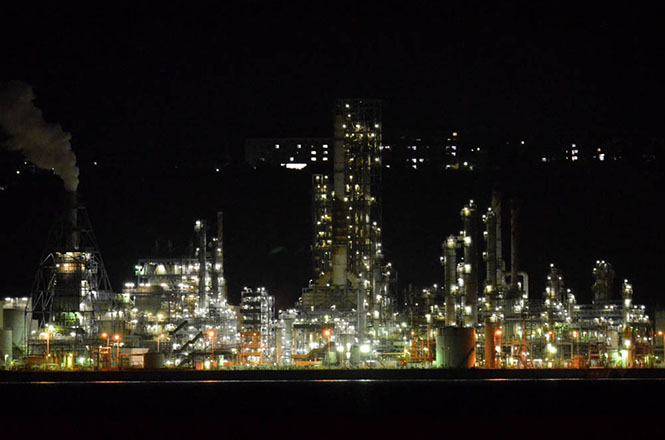 Therefore the city is a few town that vistors can unusually enjoy a scenery of the factories in Hokkaido, and night views are popular, too. 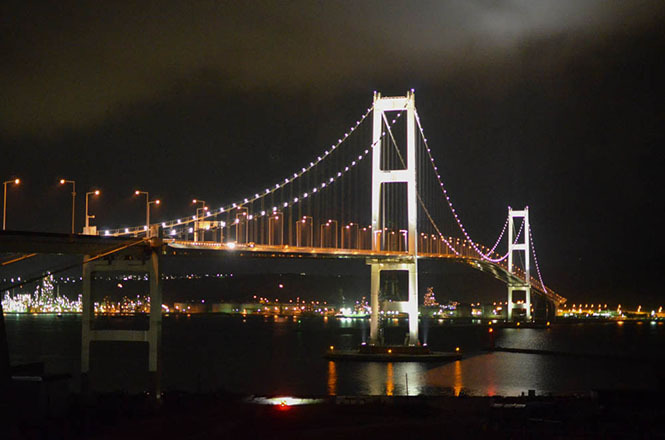 There are tourist attractions such as Hakucho-Ohashi Bridge (白鳥大橋) across the Muroran port and Cape Chikyu (地球岬) as well as an industrial inheritance in Muroran that about 770,000 tourists visit. 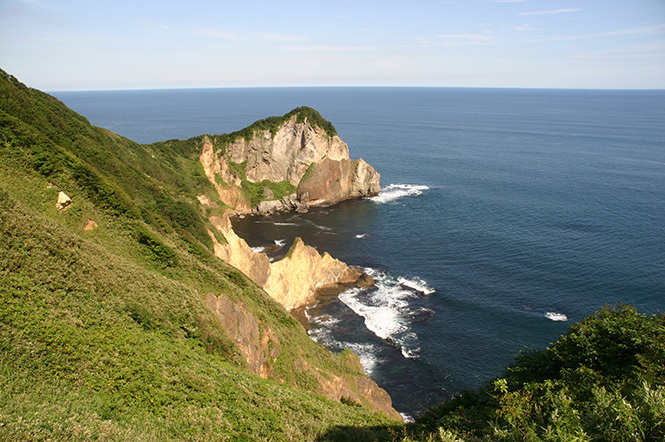 The Muroran has superb views in Hokkaido, and unique nature views such as Tokkarisho (トッカリショ) and Itanki Beach (イタンキ浜) are one of the high points of the Muroran. 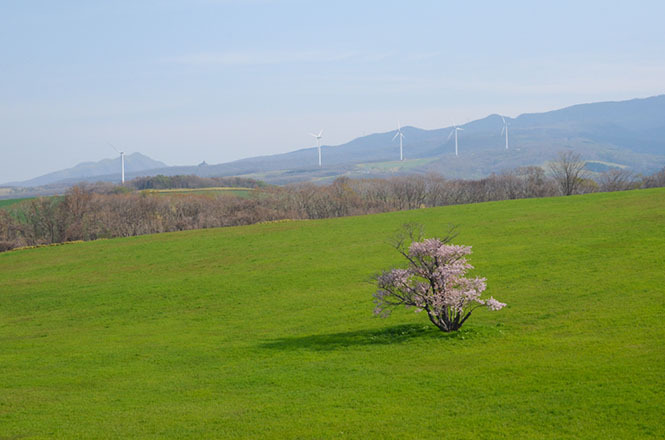 Those nature views are popular for shooting place of Japanese Movie, TV Drama and CM. So visiting the real-life locations is popular, too. 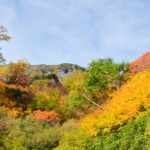 The Muroran is roughly divided into 2 parts, Muroran Station part and Higashi-muroran Station part, and the Muroran Station part is the old town, and the Higashi-muroran Station part is the new town, and the Higashi-muroran Station part grows at present. 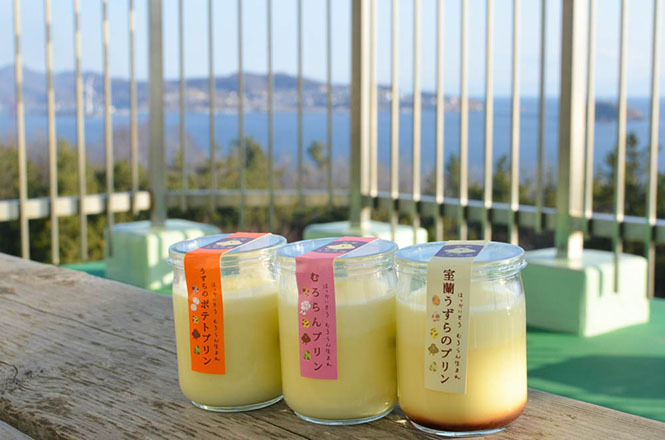 As for Onsen, the Muroran has no famous onsen, and people can take a day trip onsen at Rakuraku Onsen (楽々温泉) near the Higashi-muroran Station. 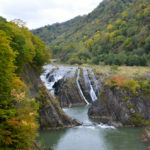 If you want to enjoy the famous onsen, Noboribetsu Onsen (登別温泉) and Kitayuzawa Onsen (北湯沢温泉) is easy to access because Noboribetsu city and Date city are adjacent to the Muroran. Speaking of tasty foods of the Muroran, Curry Ramen (カレーラーメン) and Muroran Yakitori (室蘭焼き鳥) are famous. 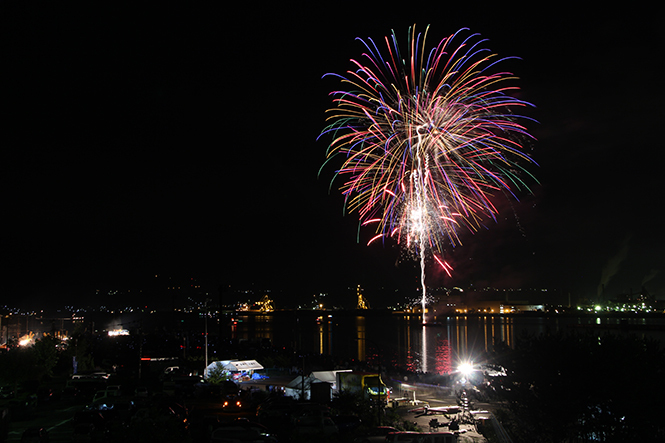 By the way, Muroran Port Festival (むろらん港まつり) is held in late July, and Swan Festa (スワンフェスタ) is held in early September. 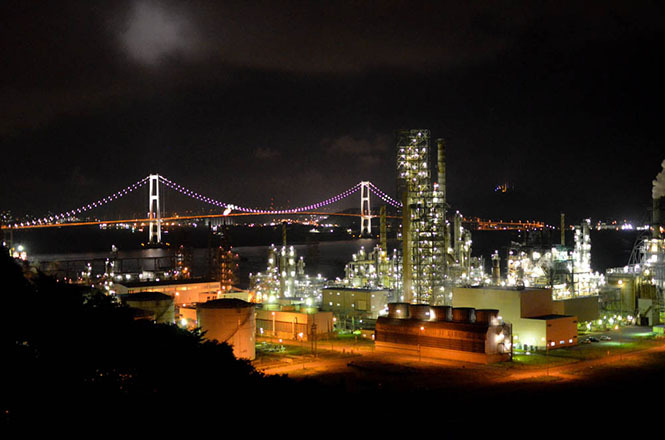 Muroran Night View is one of the 5 major factory night views in Japan. 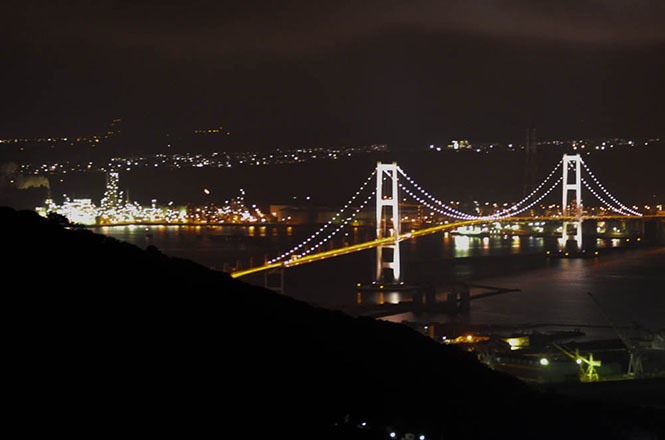 Tourists are attracted to a scenery that looks like a picture drawing the lights of factories and the Hakucho-Ohanshi Bridge across the Muroran port. You will really admire it when you indeed look at the view. Representative night view spots are Hakuchowan Observation Tower (白鳥湾展望台), Hakucho-Ohashi Observation Deck (白鳥大橋展望台), Etomo Seaside Park (絵鞆臨海公園) and Sokuryoyama Observation Deck (測量山展望台), Shiomi Park Observation Deck (潮見公園展望台), Mt.Nabeshima (鍋島山) and Hachodaira Observation Deck (八丁平展望台). 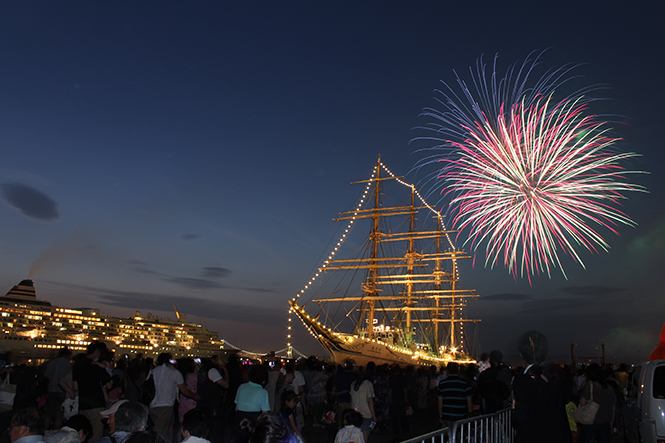 In addition, a night cruise navigating the Muroran port with a ship is held. My visited places are as follows. 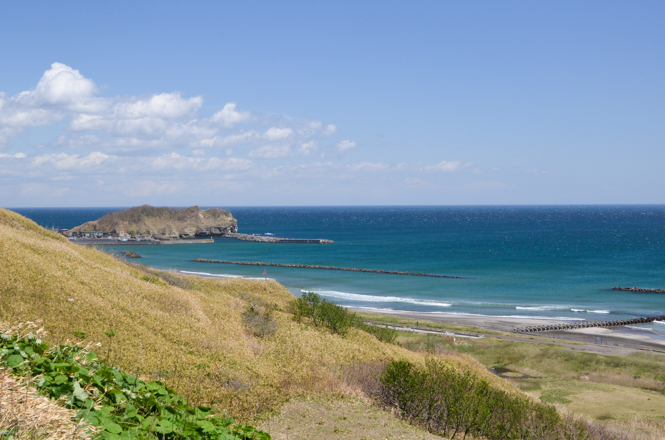 Etomo Seaside Park is adjacent to Roadside Station "Mitara Muroran (みたら室蘭)". Tourists can look at Hakucho-Ohashi Bridge and factories of JX Nikko Nisseki Energy from a yacht harbor. Please be careful not to fall into the sea because your step is considerably dark. Admission free. A parking lot is free of charge. 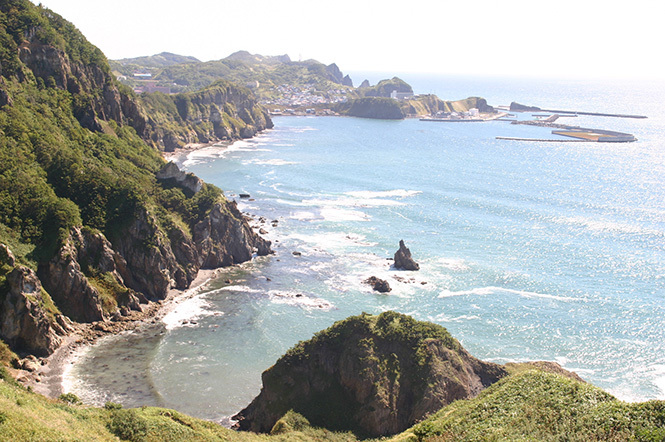 There are tourist attractions called Muroran 8 beauty spots in the Muroran. 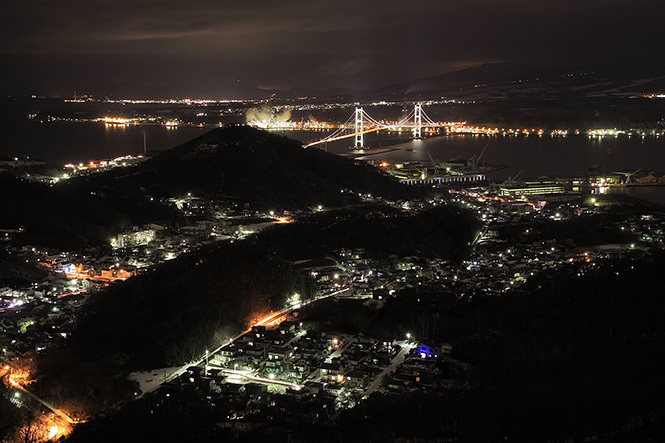 The Muroran 8 beauty spots are Muroran Port Night View (室蘭港の夜景), Mt. 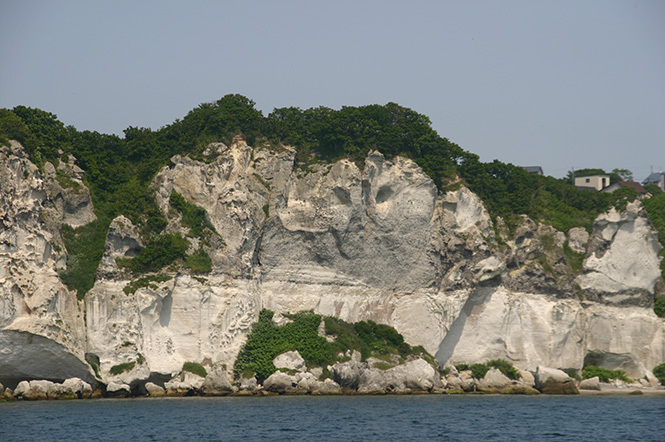 Sokuryo (測量山), Daikoku Island (大黒島), Scenery of Cape Etomo (絵鞆岬の景色), Kinbyobu (金屏風), Ginbyobu (銀屏風), Masuichi Beach (マスイチ浜), Cape Chikyu (地球岬) and Tokkarisho (トッカリショ). 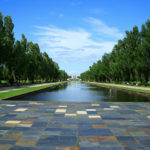 Nature cruise as well as those sceneries is famous. My visited places are as follows. 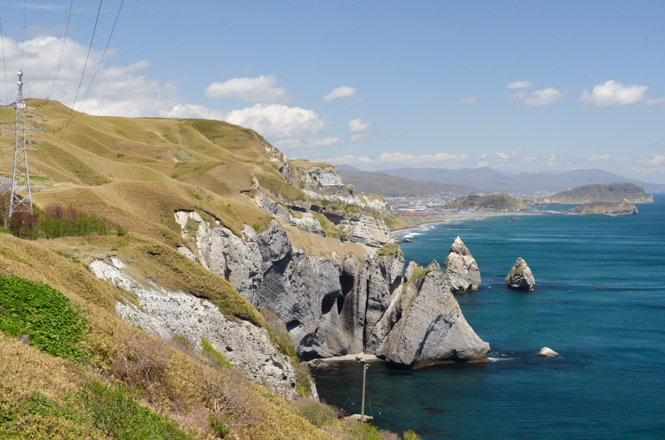 Cliffs, Colors of Grass and Color of Sea Are Great! 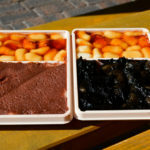 It is said that the Muroran has three major foods. The first is the Curry Ramen. The second is the Muroran Yakitori. The last is Black Rockfish dish (クロソイ料理). Unfortunately, I have not eaten the Black Rockfish dish. 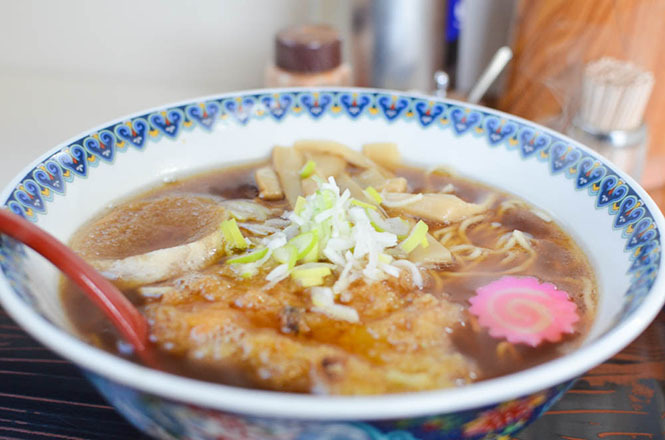 In addition, the normal Muroran Ramen and sweets of the quail's egg are famous, too. As for tasty restaurants in the Muroran, Yakitori-no-Ippei (やきとりの一平), Aji-no-Daio Muroran Head Office (味の大王 室蘭本店), Handmade Soba-dokoro Enishi (手打ちそば処 縁), Gentle Men (じぇんとる麺), Toritasu Head Office (鳥辰 本店), Broughton (ブロートン), Sobakiri Chiso (そば切り 馳走), Oshokuji-dokoro Ajishin (お食事処 味しん), Nozaki (乃ざ喜) and Seiyoken (清洋軒) are famous in particular. 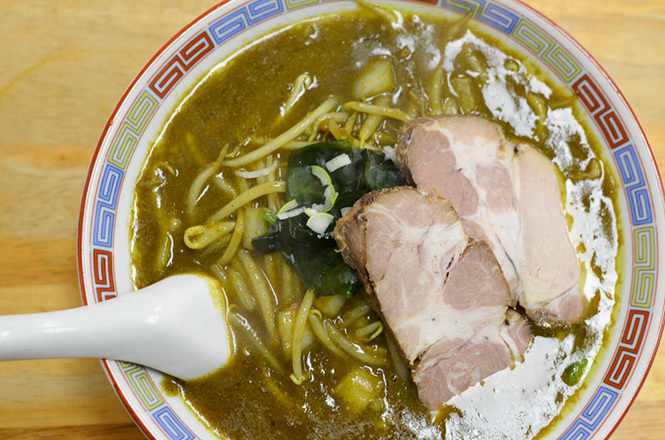 Muroran Curry Ramen contends against Kushiro Ramen for getting the Hokkaido Ramen of the 4th seats (Top 3 seats are Sapporo Ramen, Asahikawa Ramen and Hakodate Ramen). It features curry taste soup and curly noodles. 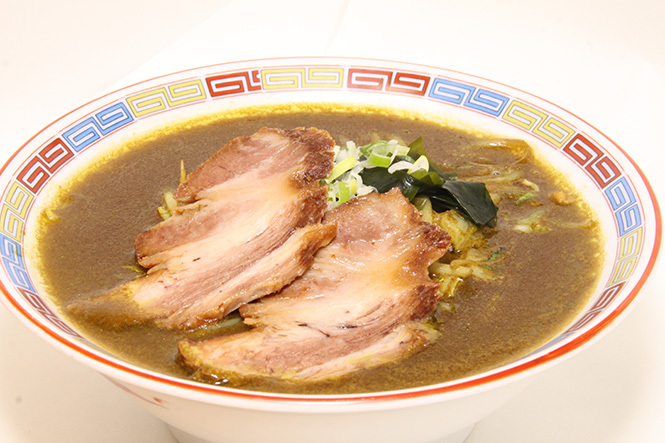 About 30 restaurants such as Aji-no-Daio serve the curry ramen. I visited the Aji-no-Daio Muroran Head Office. 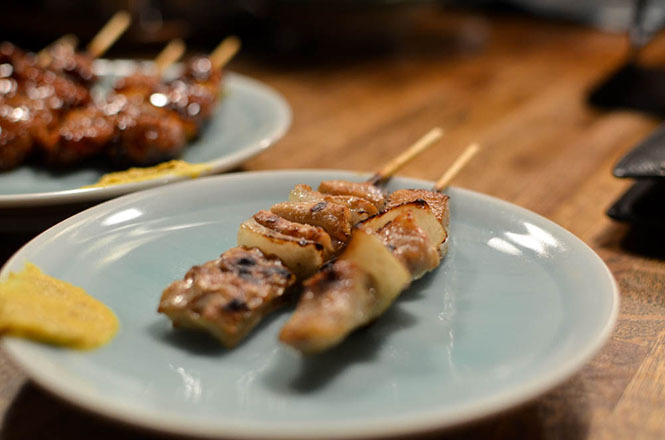 Although Yakitori means a grilled chicken skewer, The Muroran Yakitori does not use the chicken. 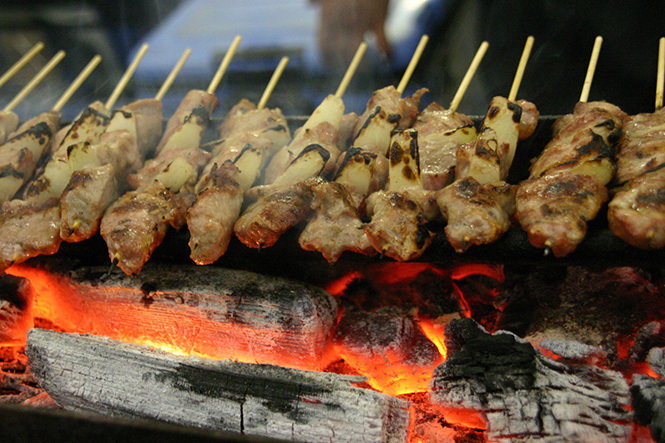 It is a grilled pork skewer with grilled pork and grilled onion, Muroran people usually eat it with using mustard. About 50 grilled chicken restaurants such as Toriyoshi (鳥よし) that is said to be an originator, Yakitori-no-Ippei (やきとりの一平), Toritastu (鳥辰) and Yoshidaya (吉田屋) serve the Muroran Yakitori. I visited Yakitori-no-Ippei Head Office. Fishery products soup made from kombu produced in Muroran sea and dried bonito is basic of the Muroran ramen. It features a light taste. There are about 50 ramen restaurants. 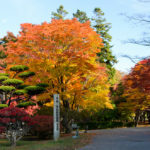 I visited Seiyoken (清洋軒). 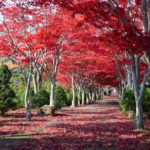 Other tourist attractions such as Horomoe Large Cherry Tree, A Sakimori Cherry Tree, Hakucho-Ohanshi Bridge and Muroan Aquarium are famous. My visited places are as follows. 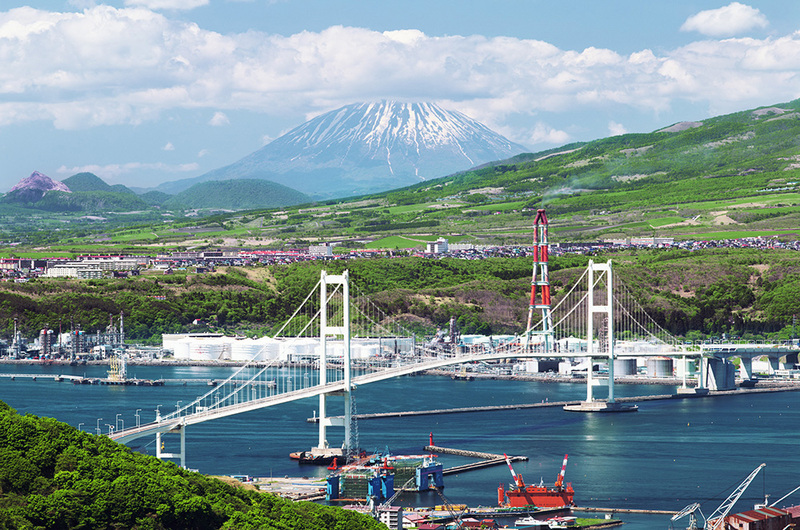 Hakucho-Ohanshi Bridge is the largest suspension bridge in the Hokkaido, and was built for 40 years from the concept, and was inaugurated in 1998. 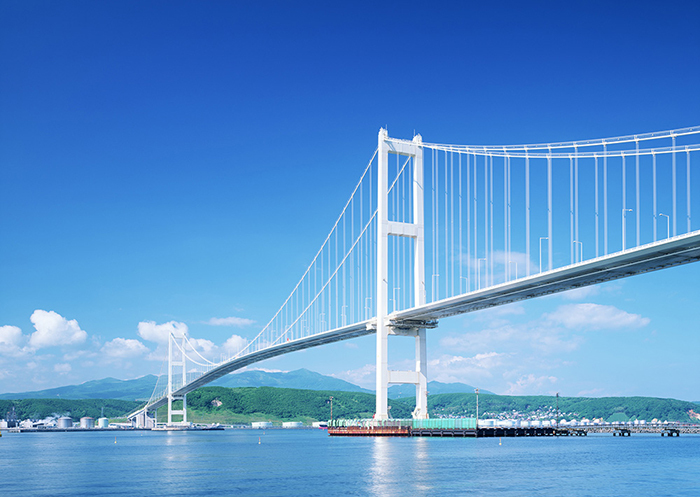 The name of the bridge is named after Gulf of Hakucho (白鳥湾). 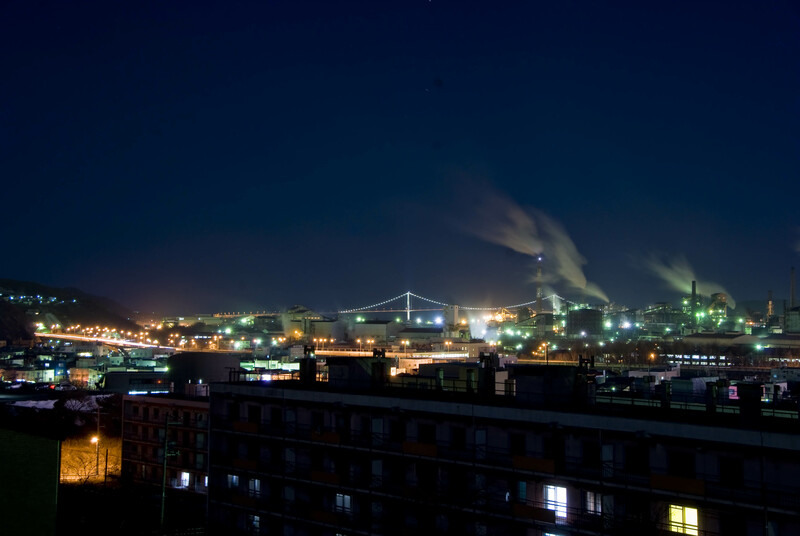 A night view of Hakucho-Ohashi Bridge that is lit up is loved by everybody. Roadside Station "Mitara Muroran" has Hakucho-Ohanshi Bridge Memorial Hall (白鳥大橋記念館) at the building, and documents of Hakucho Bridge are displayed. 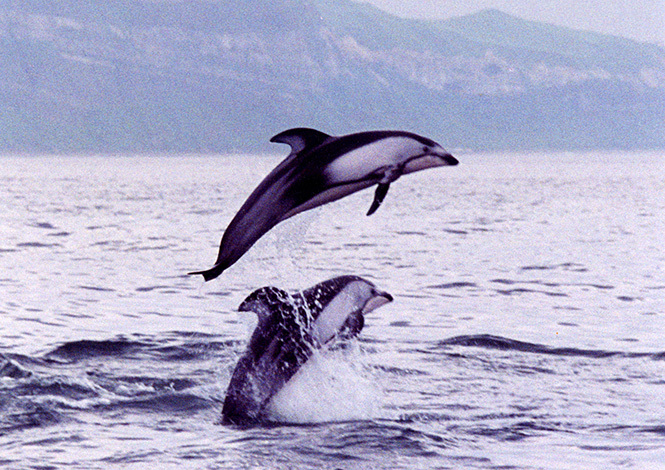 Star Marine KK and Donan Bus serve night view tours and a dolphin and whale watching tour. You can get information regarding online reviews and photos. 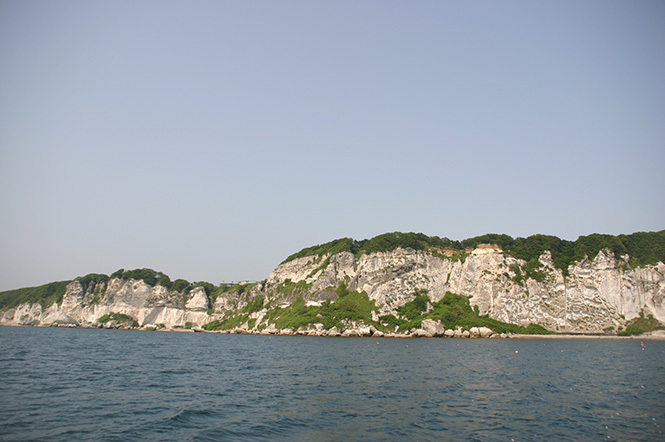 7 kinds of marine habitats such as Head Dolphin, Bottlenose Dolphin, Dells Porpoise, Minke, Killer Whale, Fur Seal can be watched from mid June to mid August. You can meet with about 1,000 dolphins if you are lucky. It is the pacific tour for two and a half hours. Star Marin KK (スターマリンKK) carry out the tours. A reservation is necessary for the embarkation. 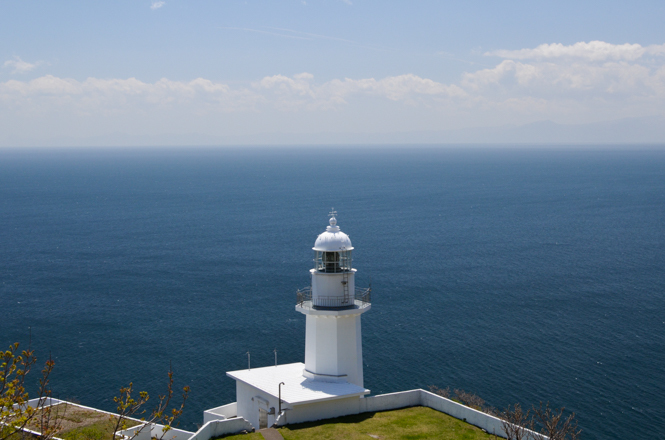 Tourists can make a round trip of Muroran port for about 1 hour. 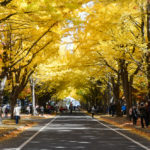 Because the tourists can look over factory groups symbolizing muroran called "Iron Town" and Hakucho-Ohashi Bridge from sea, this tour is popular. An operating company change the sailing time depending on the time for sunset, and you should confirm it on the telephone beforehand. In addition, they should confirm it in total when there are not more than 5 people of embarkation because they do not seem to set sail. A reservation is necessary for the embarkation. 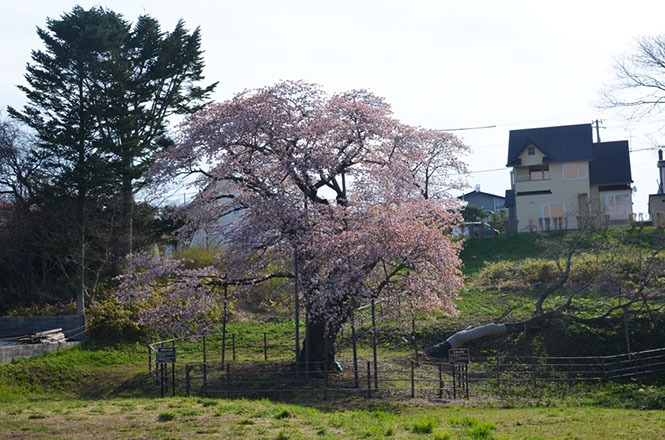 Refer to following websites for the accommodations in the Muroran. You can get information regarding online reviews and photos.